When hardware acceleration is enabled, the stability of the conversion depends upon the stability of the graphics drivers. Older Intel graphics drivers are unstable and cause handbrake and quicksync to crash and conversions to fail randomly. Upgrade to the recommended Intel graphics drivers to fix the issue.See this thread for more details. If you’re using a network path/share, mapped drives, google drives or any other non local drives, make sure these drives are available to the LocalSystem account for services running in system login. By default mapped drives are ONLY available for the user who has logged into the system and then mapped the drives (network, google, remote etc) in the user login. Since MCEBuddy runs as a service in using the LocalSystem account. Think of this a system login. You normally login through your own user login. So when you map network drives it is only valid for apps that are running through your user login. 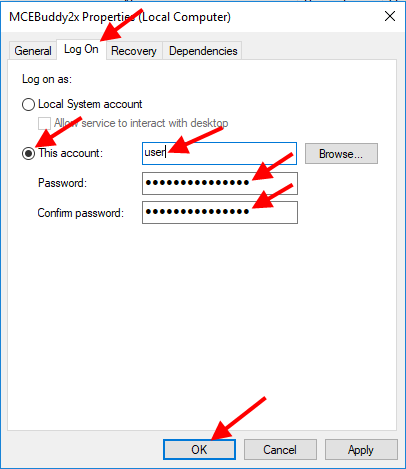 Since MCEBuddy is running through a system login your mapped drives and credentials doesn’t exist in the system login session (you entered them in your own login session). 1. When MCEBuddy is running as a LocalSystem service, to access network shares that have usernames and passwords you need to enter the username and password for each share separately in MCEBuddy. Use a fully qualified network path in MCEBuddy like \\<machine or IP Address>\<share name> and enter the username and password credentials for that path in MCEBuddy by clicking on the credentials ( ) icon next to the path. Do not use your mapped drives (e.g. Z:) since they don’t exist outside your user login session. 3. Run MCEBuddy Engine as a Command Line Service from the Start Menu -> MCEBuddy -> MCEBuddy Command Line Service. This runs the engine locally (after the user has logged) from the User’s login and hence all mapped drives available to the user will be available to MCEBuddy. c. Make sure the network drive is connected and accessible. Windows is VERY FINICKY. You cannot map the same Network share more than once with different credentials. If you’ve connected to the remote computer using Windows Explorer or the Run command, then you’ve already logged in with one set of credentials. If MCEBuddy now tries to connect with a different set of credentials it will FAIL since Windows will reject it. This issue has been resolved with 2.3.15 and later versions of MCEBuddy. The files are marked readonly or are locked by another process. MCEbuddy needs exclusive access to convert files. Check the file search pattern (e.g. *.wtv) for the monitoring location task. It may not be setup to accept all video/video files types in the directory being monitored. Remove the readonly option on the files, right click on the file and select properties. Uncheck the ReadOnly box. If the file is locked by another process, you’ll have to find out which process and then close the process/release the file. Refer to the MCEBuddy Advanced Commands page for more details on filename and showname pattern matching. Remove the readonly option on the files, right click on the file and select properties. Uncheck the ReadOnly box. If the file is locked by another process, you’ll have to find out which process and then close the process/release the file. Check the Filename, Showname and Network name filters in the Conversion Task Settings page. If the filters don’t match the metadata on the file, the files will not be added to the queue. I keep getting MCEBuddy Service is unavailable. Please start from windows control panel or check engine connection. If the engine crashes when trying to convert a file this indicates a hard disk corruption. The hard disk driver will terminate MCEBuddy when trying to access a corrupted file. The corrupted file could be either the MCEBuddy installation or the file/video it’s trying to access which may be corrupted. Delete the file and uninstall/reinstall MCEBuddy as a temporary solution, the underlying cause is a failing hard disk which should be replaced at the earliest. If there is a conflict with another port, MCEBuddy will fail to start, check the Windows Event logs for more information and see the Installation Issues for more details. If you have ShowAnalyzer installed; there’s a bug in ShowAnalyzer which causes it to hang. The MCEBuddy User Application makes a call to check the status of ShowAnalyzer which causes it to hang and it presents itself as not able to connect to service issue. Uninstallation, rebooting the computer and reinstalling Showanalyzer usually solves the problem. If it persists, try to uninstall ShowAnalyzer and use Comskip instead. Permissions or owner are set incorrectly on the parent folder which causes the files created by MCEBuddy to inherit permission that don’t match the shared folder permissions. Ensure that the destination folder and the files are inheriting the permissions from the parent folder and the parent folder has the permissions you need for others to view the files (e.g. Read/Write/Modify for Guests or any other user). Also ensure that owner for the parent folder is set to you. Use the WTV Legacy profile which uses MPEG2 in WTV for older devices like Ceton Echo and Linksys DMA2100. The other option is to use the WTV Unprocessed profile if your original video plays back correctly on your Extender. On the machine where MCEBuddy engine is installed, check Enable remote access from Settings -> Advanced Settings -> Expert Settings. This will allow MCEBuddy to automatically create an exception in the Windows Firewall to allow incoming connections to the engine on the configured port. This only works with Windows Firewall, if you have a custom firewall then you’ll have the configure it manually. MCEBuddy causes a lot of stress on system drivers causing a faulty system driver or hardware to fail or hang the system. MCEBuddy CANNOT cause a system crash or hang because it’s a managed application, the ONLY piece of software that can cause Windows to crash or hang is a driver. The hang or crash is because of a faulty driver (it is the only piece of code privileged enough to cause a bug check) or failing hardware on the system. At most an application can cause itself to crash where as kernel mode driver or failing hardware can cause a bug check or hang. Most likely it is either your video driver, chipset driver, hard disk driver or faulty hardware which under stress is exposing the flaw. MCEBuddy can be quite stressful on the system so keeping good hardware and drivers is paramount. For a crash, to isolate the root cause of the bug check you will need a software like WinDBG to analyze the kernel memory dump created by windows in the windows\minidump directory. This will tell you which driver caused the panic and why (big check code). You will need to start uninstalling or updating your drivers to find out which one is causing the issue. Some recording have multiple audio tracks, sometimes these audio tracks do no contain any audio or contain a narrative track (vision impaired). Which audio track is selected depends up on how MCEBuddy is configured. If Select the best soundtrack is checked, then the encoder (handbrake, ffmpeg or mencoder) will decide the best audio track to use. Often Handbrake can get this wrong while ffmpeg is better at it. If you’re using this option, try to change the order in your profiles.conf to have ffmpeg as the first encoder. The other option is to uncheck Select best soundtrack, in which case MCEBuddy will choose the best audio track with the highest number of audio channels and highest bitrate. If you want a specific audio track, add the file to the conversion queue, right click on the file and select MediaInfo. This will show all the available audio tracks in the file. If the file contains impaired audio tracks then note the language of the audio track which NOT impaired. Open Settings-> Change Conversion Task Settings -> Advanced Settings -> Audio Language. Select the audio language of the non-impaired audio track as determined from MediaInfo earlier. Do not worry if more than one audio tracks (impaired and non-impaired) have the same language. MCEBuddy will choose the non-impaired audio track when an Audio Language has been selected. If you’re using 2.1.5 or greater you can use this option to manually add the files not to be converted to the history file in the following manner. In Windows Explorer select all the files you want to add to the history file. Drag and Drop them into MCEBuddy window (MCEBuddy should be started and it should start converting them). Now select all the files in the conversion queue (Click on the 1st file and press Shift + End) and then click Delete. It will stop converting all the files and add them to the History file and they will not be reconverted unless you add them manually. Create a folder called MCEBuddyArchive. Put all files you don’t want converted into this folder, MCEBuddy will not convert any files inside this folder. Please note, when the Archive Files option is selected in the advanced settings page, MCEBuddy does this automatically. Open the Conversion Task you’re created. In the Advanced Settings is a File Name Match (read the documentation MCEBuddy Advanced Commands). You can specify a negative filter (with ~) to specify which files NOT to convert OR a regular filter to specify which files to convert. There are many reasons for the Audio to be out of sync with Video. It can vary from corrupted frames to country format differences. There are many things can do to resync the Audio with the Video. If you’re using a FFMPEG profile, trying setting the -ss parameter to -ss 30 to see if that solves the problem. Try setting the <encoder>-audiodelay=skip for the profile you’re using. If you’re using MEncoder in your profile and your audio is going out of sync ONLY when commercial removal is enabled then try to use the mencoderedlskip=true option to use the MP4Box fallback method to strip out commercials. (again this will only help if commercials removal is causing the desync in audio while using MEncoder). Try setting UniversalCommercialRemover=true if the above doesn’t work. Refer to the MCEBuddy Advanced Commands for more details on the above. The video is copy protected. Record a non-copy protected video. There is no way to convert copy protected videos. To check for Copy Protection, right click on the video -> click properties. Check the Video properties page and look for the copy protection field. Check the log files, if the average rate of dropped and/or duplicate frames are high, MCEBuddy is unable to detect the correct video frame rate which leads to stuttering video. For corrupted original video, check the quality of the recording signal. A low quality signal can lead to corrupted recordings. Refer to MCEBuddy Advanced Commands for more details. MCEBuddy by default limits all the output audio to 2 channel audio (stereo) to preserve compatibility with many 3rd party players and Windows Media Player (which doesn’t support multichannel audio). Sometimes when source video files have multiple audio tracks with different number of channels, MCEBuddy downmixes the audio to preserve compatibility. In MCEBuddy, in the Conversion Tasks page, under Advanced Settings, enable Multichannel Audio. This will tell MCEBuddy to output multichannel audio if the source video has multichannel audio. If your source video has multiple audio tracks, then in the Conversion Tasks page, under Advanced Settings, select the Audio Language or enter the 3 digit Audio Language code corresponding to the audio track you want to keep. You can find out which audio tracks are there in the source file by right clicking on the file in the conversion queue from the MCEBuddy main Status Page Window and selecting MediaInfo. Windows (Vista and 7) sometimes by default sets the Operating System to disable Wake Up timers. this is especially true for portable systems and laptops. When the System Wakeup timers are disabled no application can wake up the system from standy/suspend mode. Also sometime computer BIOS have disabled wake timers and wake support. Make sure Allow Wake from USB (or equivalent power wake options) are enabled in the BIOS. Make sure Wake Timers are enabled in the system. Follow the steps below to enable Wake Timers. MCEBuddy is running out of diskspace and the conversions fail in between at random points when it runs out of disk space. This is aggrevated when multiple conversions are being used. a) Sometimes Antivirus software such as AVAST are known to interfere with MCEBuddy. These software lock down the file when it is accessed by MCEBuddy and this causes the conversion not to start, hang or randomly fail. Try to disable the Antivirus and see if that solves the problem. b) MCEBuddy needs 3 TIMES the size of the file being converted as free space on the INSTALLATION DRIVE. i.e. If MCEBuddy is installed on C drive and you’re converting a 4GB file then you need 12GB of free space on C drive. NOTE: MCEBuddy needs 1.5X free space for EACH file being converted simultaneously. i.e. if you have 3 simultaneous conversions and each file is 4GB in size, you need 1.5x3x4 = 18GB of free space on the installation directory! 2. Set the temp directory to point to a different drive where there is more space. Refer to MCEBuddy Advanced Commands for more details. a) If you’re using a network path/share in the Monitor Task to monitor a network folder or if you’re using a network path/share as the destination folder in the Conversion Task, make sure you enter the username and password in the MCEBuddy Credential box next to the Monitor Path or Destination Path text box by clicking on the button. Even if you shared the network share without a password or anonymous or guest or everyone, you MUST enter atleast Guest in the username of the credential page. This is because MCEBuddy uses LocalSystem account and not the local user account to authenticate on the network, so the mapped drives or logged on user authentication will not be accessible by MCEBuddy. b) If you’re using the Add File button or dragging and dropping files/directories into the queue then you need to add the network login credentials to Settings -> Expert Settings -> Network Authentication. This MUST match the same credentials that have been used to access the network share via Windows Explorer or if the network share has been mapped to a drive. See point c) below. d) Make sure the network drive is connected and accessible. a) Make sure you enter the username and password in the MCEBuddy Credential box next to the Monitor Path or Destination Path text box by clicking on the button. Even if you shared the network share without a password or anonymous or guest or everyone, you MUST enter atleast Guestin the username of the credential page. This is because MCEBuddy uses LocalSystem and not the local user authentication and local system does not authenticate on the network. b) Check if the path has already been mapped by Windows, this can create a conflict. To check the mappings, open a command prompt (Start -> Run -> cmd). Type net use and it should show you the mapped drives. You’ll have to disconnect the necessary paths (net /delete <pathname>). Alternatively, map your path to a drive in window (explorer -> tools -> map network drive) and then don’t enter any username and password in mcebuddy instead use the mapped drive. c) Make sure the network drive is connected and accessible. Windows is VERY FINICKY. You cannot MAP the same COMPUTER 2 times with different logins. If you’ve connected to the remote computer using Windows Explorer or the Run command, then you’ve already logged in with one set of credentials. If MCEBuddy now tries to connect with the configured credentials it will FAIL since Windows will reject it. 1. Either use your own credentials and MAP the remote computer folder using Windows explorer and DO NOT enter any credentials in the Monitor Task or Conversion task pages for that remote computer. In this case MCEBuddy will use the Windows Explorer credentials. 2. Enter the credentials in the MCEBuddy Monitor Task and Conversion Task page and let MCEBuddy connect to the remote computer. Remember you CANNOT DO BOTH of the above, otherwise MCEBuddy will not be able to access the remote computer. In the Conversion Task -> Expert Settings page, in the Subtitle offset box, (this optional will be available when Extract subtitles and closed captions is checked on the previous page), enter the number of seconds to adjust the subtitles (+ for forward or - for back). This will cause MCEBuddy to timeshift all the Subtitles to correct the sync issue. If you are seeing the subtitles get progressively out of sync after each commercial that was cut, then in the Settings -> General Settings -> System Settings page under Subtitle commercial cut sync you can enter the number of seconds it is progressively going out of sync after each commercial segment is cut. Sometime a very large history file or a corrupted history file can cause MCEBuddy to hang. Similarly other corrupted files can cause MCEBuddy to hang. Place the .EDL and/or .SRT files along with the source video. MCEBuddy will automatically pick up these files (make sure Remove Ads is set to Comskip or Showanalyzer and/or Extract CC is enabled in the Conversion Task - MCEBuddy will use the custom EDL/SRT files before generating new ones). Also make sure they have the same name as the source video. Refer to the MCEBuddy Advanced Commands for more details on Custom EDL/SRT Files. TV shows sometimes change the audio formats between shows/advertisements which causes FFMPEG, Mencoder to fail. Calculate (in seconds) the amount of time the previous show/advertisements are recorded before the start of the main show, add a few seconds to it for safety and put that value in the Start Trim box under Conversion Tasks -> Advanced Settings. E.g. There is 2 minutes and 30 seconds of video before the main show starts, put 155 in the Start Trim box. Similarly calcuate the number of seconds after the show ends of video that is recorded (next show/advertisements) and put that value in the End Trim box. This will make MCEBuddy trim the start and end of the video and leave just the show for conversions which should solve the problem of changing audio formats.